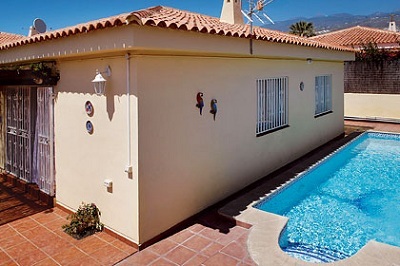 Villa Eden is a modern detached villa situated on the Sueno Azul development in the Callao Salvaje resort in Tenerife. The villa is just a 10 minute walk from the centre of the resorts where guests will find a selection of restaurants and shops as well as the beach. The villa has a comfortable lounge and dining area and has three bedrooms: one double and two twins. The master bedroom has its own ensuite bathroom and there is an additional family bathroom which the other 2 bedrooms share. Outside the villa has it's own electrically heated pool and sun terrace. There is also a covered terrace with patio table and chairs and the villa has it's own built-in oven, which makes it perfect for alfresco dining. Car Hire is not necessary, but could be an advantage if guests want to explore the island. A refundable security bond of £200 is payable with the booking fee. This will be refunded back to guests after the holiday, providing there are no breakages. There is no wifi internet access in the villa, but it is available in the nearby pool bar.